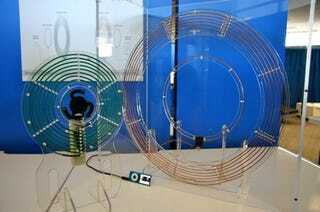 Wireless power? Nothing new. It's been around for at least 100 years, although only recently has it reached the point where a completely wireless future was believed possible. Now, an update of sorts from MIT WiTricity means it's even closer. Previously, an MIT WiTricity team, led by physicist Marin Soljacic, powered a 60-watt light bulb from across the room using a magnetic coil. That was 2007. Today, that MIT team has shown it is possible to power two devices, wirelessly, when the are placed on either side of a single 1-sq. meter coil. The effective distance from coil to device was anywhere between 1.6 to 2.7 meters. Cooler still, the researchers discovered that by using two devices the power transfer was 10% more effective than using just one. Additionally, the researchers' models suggest that the efficiency would increase even more should they try and introduce more devices into the mix. The New Scientist article detailing the technology says this occurs because "more of the broadcasting coil's field falls on receptive receivers." The end game is a wall or ceiling-mounted coil that would wirelessly power an entire room of gadgets. One remaining issue is distance: When the devices are moved outside the 1-2 meter range, the signal deteriorates rapidly, as would be expected. Fortunately for wireless power buffs, MIT is working on a specialized antenna to counter the weakening signal.